Wonder how to get Lancer Zero Hecarim? It is only available in the League of Legends loot crafting system! By combining 10 Gemstones into this amazing skin, you can hop in there and test it! The skin is showcased in the skin review to the right! Slowly, Riot’s artwork team has released some absolutely stunning skins exclusive to the Hextech Crafting system. Lancer Zero Hecarim was the next choice, joining Blitzcrank as another Lancer Zero Champion. 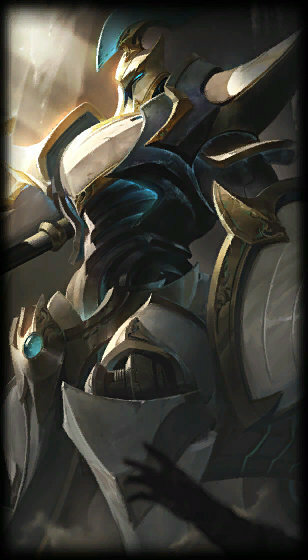 This skin line features amazing futuristic, white or cream color schemes that make Champions like Hecarim incredible visually. As with all other Hextech skins, they are incredibly rare to see ingame and they are very hard to obtain. You too can join the elusive club by getting a skin like this! The skin was released on August 17th 2017. This skin is a part of the Lancer Zero skin line. They always feature amazing updated graphics and animations that make battles ingame absolutely stunning! If you want to check out the new patch, Lolskinshop can help you, we are selling PBE accounts. Note Lolskinshop.com does not sell this skin, never have, and most likely never will! This page is an information page. We have collected all the different parts needed to create one good page that highlights every part of this specific league of legends skin. We would also like to point out that the only way to ever getting this skin is through the official Riot store, where you buy it for Riot points. There is no point looking for it on Ebay or other third party sites, it simply does not exist! Lancer Zero Hecarim skin review and information. Sounds New sounds for every skill and recall!